Deng, actually, has made his share of big plays and big shots in his Bulls career, memorable late game defense and winning free throws in Miami in 2011 when the Bulls were sweeping the Heat in the regular season. There was a game winner in Toronto a few years back and a big clinching three just a few weeks ago against Charlotte before the Bulls took off for their Western road trip. So Deng will make big shots. But he’s never in his career with the Bulls been hired to do so. Until this season. First it was Ben Gordon, who was drafted ahead of Deng in that same 2004 draft. Though the Bulls still were going to Eddy Curry back then. Ouch. Gordon — called Ben Jordan — emerged that season as a big shot maker and would lead the Bulls in scoring the next four seasons. Until Derrick Rose came along and led the team in scoring the three seasons after that and even was taking big shots as a rookie. Deng did lead the Bulls in scoring last season. But when a big play was needed at the close, it was Marco Belinelli with three game winners last season or Nate Robinson, who came up with big shots in the playoffs. It’s never been his game, actually, as “the Man” is generally an isolation player, an athletic guard or small forward who can dribble himself into a shot or through the defense. The Bulls in Michael Jordan once had the king of the men. So everyone around the Bulls knows what it looks like. Deng doesn’t often look like that. He’s perhaps the quintessential team player, a top defender, passer and rebounder who has improved his shooting range. He’s worked amazingly hard on flexibility to become a much better ball handler from when he came into the NBA. You’ll often see Deng on the court long before games in a crouch with an assistant coach dribbling two basketballs to enhance that flexibility and ball handling. If I could do that I’d be doing halftime shows with the Red Panda or Christopher. It’s not usual to see a player like Deng in those magical situations. He’s 6-9 and straight backed with long legs. So he works and works, and now with Rose, Robinson and Belinelli gone, the job of closing and trying to win these games has fallen to Deng. It’s a tough job and even the best of them makes maybe a quarter to a third of their game winning attempts. The web site 82games.com did a study for clutch late game play based on 24 seconds or less and either tied or losing over five seasons. Kobe Bryant made 25 percent of those shots. Dirk Nowitzki was 32 percent; Paul Pierce 34 percent. The league wide average was about 30 percent. It’s a tough job since the defense usually knows who the ball is coming to. It’s generally never been Deng, but now it is and it’s becoming more difficult. Bulls coach Tom Thibodeau has taken to Deng as his “go to” player without emphasizing it too much by drawing up most plays coming out of timeouts for Deng or for Deng to make the play with a pass. With Carlos Boozer slumping, Thibodeau went to Boozer to open the second half against the Pelicans Monday. But he most often now calls the plays for Deng. They’re often a dribble handoff with Deng going to his right and pulling up or driving, which he did at the end of losses last week in Utah and Cleveland. In both instances, Deng’s drives drew the defense and Boozer in Utah and Boozer and Joakim Noah in Cleveland missed follows that would have tied or won those games. So Monday with that triple overtime game there were plenty of opportunities. The first came at the end of regulation with one of the other principal plays Thibodeau runs for Deng. It’s a handoff again from Noah as Deng works with Noah a lot. But instead of dribbling right, Deng goes left on a screen and Noah rolls. Deng then bounces a pocket pass to a rolling Noah. They’ve had difficulty connecting this season with Noah off to a slow start. The pass went bad Monday and the game went into overtime. At the end of the first overtime, the Bulls had the ball with 2.5 seconds left tied at 109. The play was drawn for Deng, who waved off Noah’s screen and went to take the ball hard right. But the ball got away and Kirk Hinrich ended up forcing a baseline shot at the buzzer that missed for a second overtime. Deng being the team player he is was, as usual, only too quick to lay blame on himself, as he most always does. 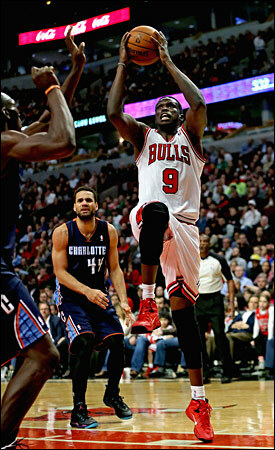 In the second overtime, Deng made a terrific seal on Aminu in the lane as Hinrich was inbounding with 6.2 seconds left. Deng got the pass and put the ball in for the tie at 122 and a second overtime. But Deng, playing 55:38, got just one shot in the third overtime, none in the last 3:07 of the overtime. He made two of four free throws in that third overtime as the Bulls went to Noah for a driving hook shot to tie it with 4.5 seconds left before Jrue Holiday’s winner. “I’m fine with it,” said Deng of moving into that role after his 37 points against the Pelicans but also with seven turnovers. “I’ve got to make smart plays. It’s something I’ll get better with. Lately we’ve been going on down the wire, so we’re going to be in that position a lot more. Every time I’m in that situation I try to make the best of it, and learn from it and next time try to make a better play. Deng is leading the Bulls in scoring this season at 19.4 per game. That would be a career high for him. He’s also averaging 7.2 rebounds, which is one tenth off his career best, and 4.1 assists, easily a career high. He’s shooting 46 percent, but 21 percent on threes. Over the last five games, Deng is averaging 27.4 points, 6.2 assists and six rebounds on 42.6 minutes per game. It’s Jordanesque type of stuff without the flair and the fancy. The Bulls are 7-9 heading to a national TNT game with Miami Thursday. But there’s no telling in this NBA this season, especially the Eastern Conference, as Miami lost at home to Detroit Tuesday. That’s the same Pistons the Bulls blew out in Detroit. And Houston lost in Utah Monday, making that Bulls loss there not so hurtful. The Bulls get back Marquis Teague for the Miami game, though he only got to enjoy a nice plane ride to Des Moines and back Tuesday. The Bulls announced Tuesday morning Teague would go to the D-League team there. Then when Mike James showed up for training Tuesday, he had an MCL sprain which only swelled overnight. Assistant general manager Randy Brown was with Teague. So they returned and Teague will back up Kirk Hinrich Thursday. Teague’s trip was just to get some playing time as he was not being used of late. The plan apparently always was to bring him back in a few weeks in the belief he’d have more confidence and been able to shake off the rust of not playing. He gets to do that against Miami now. In an unusual Eastern Conference with just Miami and Indiana better than .500.